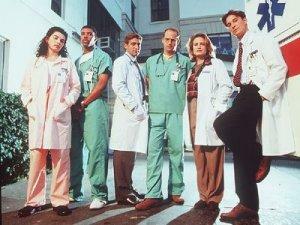 I was lucky enough to get this show assigned to me when I joined the TV division. Many of the people I had worked with on other shows had gone on to this show. I had worked with John Wells on CHINA BEACH, years prior and I was so excited to be able to work with these guys again. 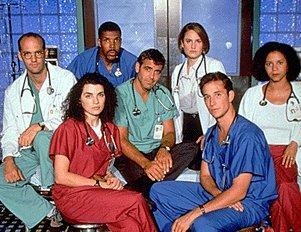 The ER CAST & CREW are a very tight group of people and they have a good time as well. 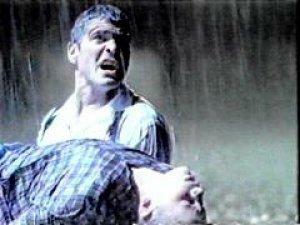 George Clooney is the king of practical jokes on the set. He loved to put vaseline under the knobs of drawers and on door handles. To kill time between scenes, everyone that wasn't in the scene would go outside and play basketball. Day and night there was someone playing basketball. We also started playing at the new court at the WB gym until large crowds starting gathering. I remember when George hurt his ankle during a game and had to use a crutch for awhile. The studio was not very happy about that. The crew made a chalk outline of George on the court where the injury occurred. I don't think they thought that was very funny either. When George decided to leave the show, we were going to have a party after the last shot. We were going to have a cake with George's pic on it and for weeks I hounded George for a pic. I told him that the only pic we had on file was one from his days on FACTS OF LIFE with the big hair. It became a running joke between us. He said he would kill me if I put that on the cake. I finally found a pic of him in a tux at an award show and we used it. The day the cake arrived it was HUGE and it looked like a VELVET ELVIS painting. We both took a look at it before the party and laughed hysterically. The time came for George to cut the cake in front of the press and guest and he had the knife in his hand, when suddenly he looked over and me grinned and stabbed the cake in the forehead of the pic. We both burst out laughing and everyone else was not sure what was going on. It was so funny... typical George. The next day I started getting hounded by reporters as the story had surfaced and for weeks the story grew. Funny how a cake can get that much attention. George took about 15 of the cast and crew out after the party and all I can say is we had a wild time. I made it home the next morning but some of the gang ended up sleeping in the production office. It was never a dull moment on the set and I have made lifetime friends. 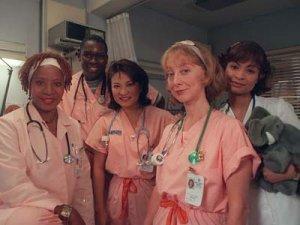 Thank you, ER for letting me be a part of the family.